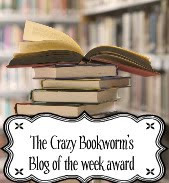 and the award goes to...*Drumroll* A Book Lovers Opinion! I love, love, love her blog! It is packed with great stuff. Head over now and say Hi! Give her a follow or a comment. Congrats to Liz at A Book Lovers Opinion for winnning this, you derserve it this week!